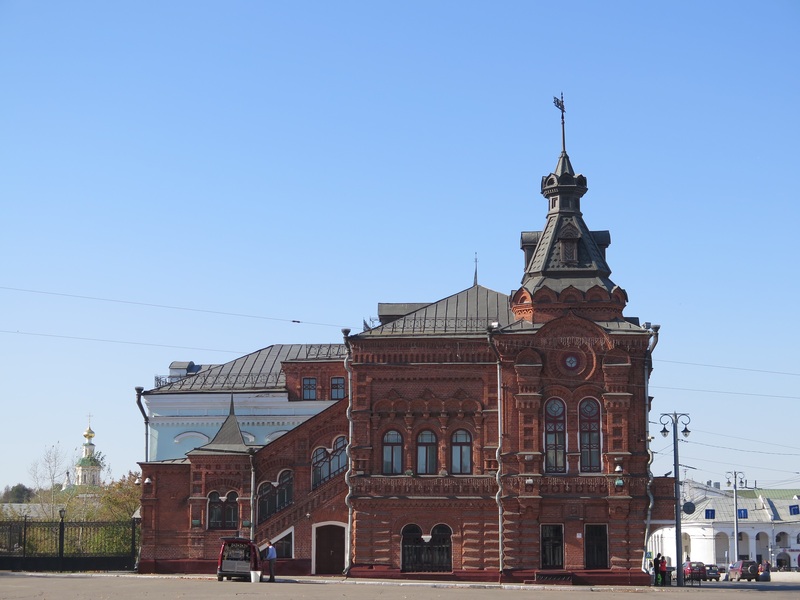 Vladimir was a very pleasant, lovely city. It felt lived-in and comfortable, and I greatly enjoyed walking its tree-lined streets. The weather is still warm–hot even–but leaves are falling and paths are yellow with them. 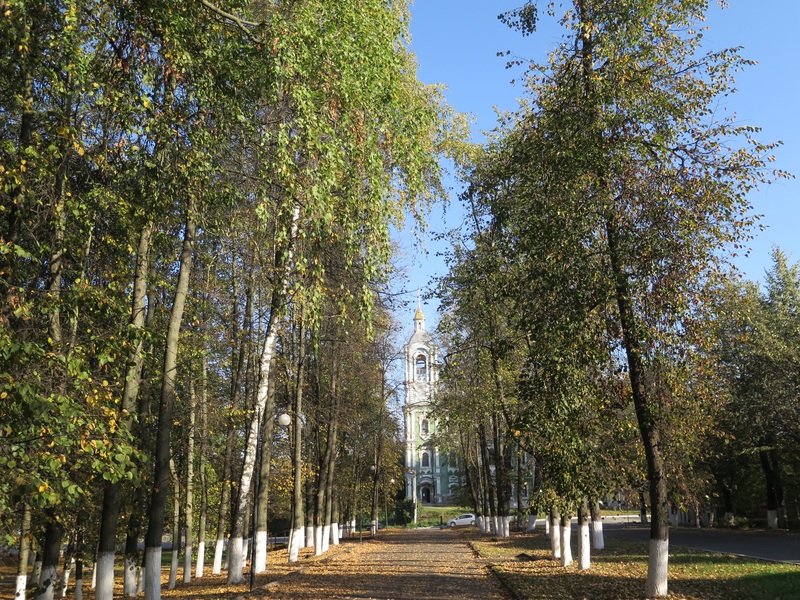 Autumn is my favorite time of year, and the morning in Vladimir was a perfect autumn morning. 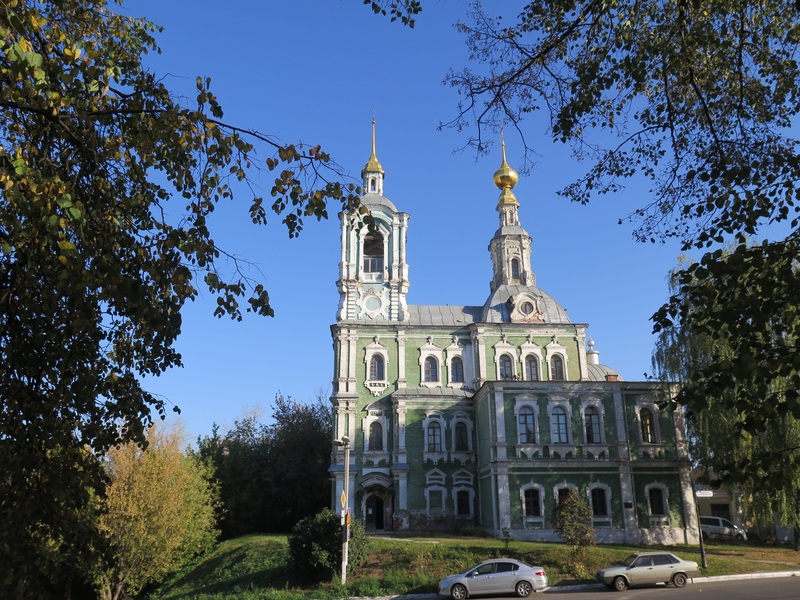 We arrived in Vladimir relatively late Saturday night, and ended up looking at hotel options in Suzdal and Moscow so long that I was ready for bed by the time we settled on some options. So our first experience of Vladimir was Sunday morning. We left our hotel around 8:30, wandering the streets and admiring the architecture until things began to open around 10:00 and 11:00. This park was one of the first things we encountered when we left our hotel on Sunday morning. The weather was so bright and crisp, the birds happy, the day perfect. Two little girls, supervised by their father, played with a puppy in the park. 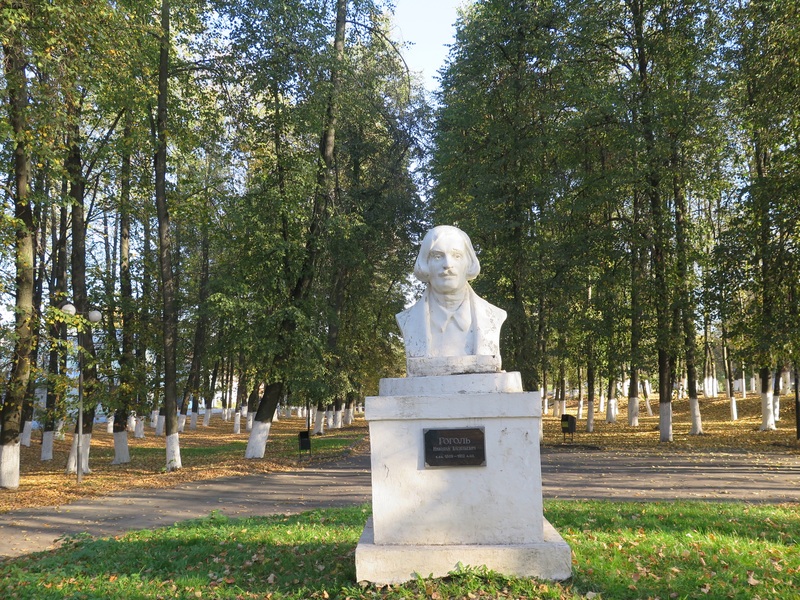 In the park was a bust of the Soviet writer Gorky. A fuller view of the church near the park. 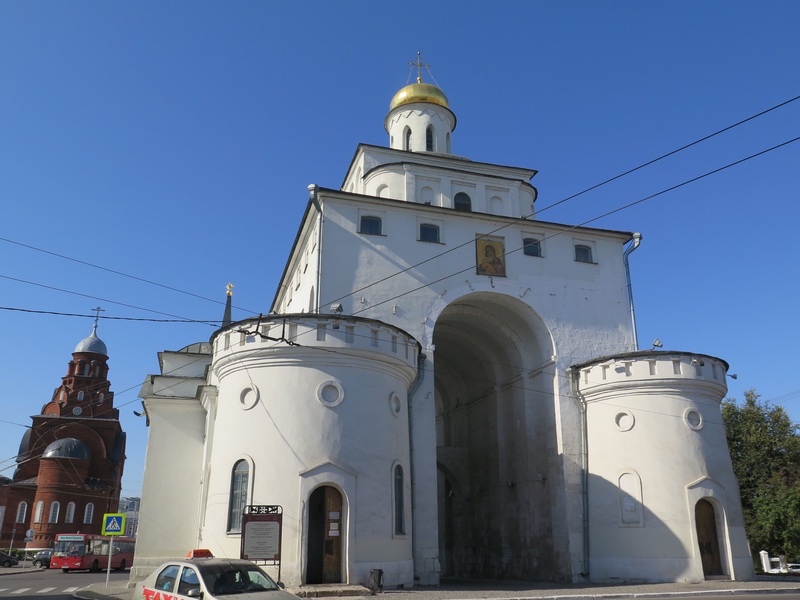 We managed to lose our map of Vladimir, and so at the moment I’m not sure what church this was. It appeared to be closed, though, and was somewhat run down. Beautiful in the morning light, though. We had a tourist map that Steve bought at the hotel (no free maps in Vladimir, apparently), but it was not the easiest map to follow, and in any case it has now somehow been lost. So I’m less able than usual to identify the place we were and the things we took pictures of. One of our first stops was at a church that I believe may have been the Cathedral of the Nativity of the Christ. There was a service in progress, and we followed a couple of women into the church. It was lovely, but I only peeked in and then left. 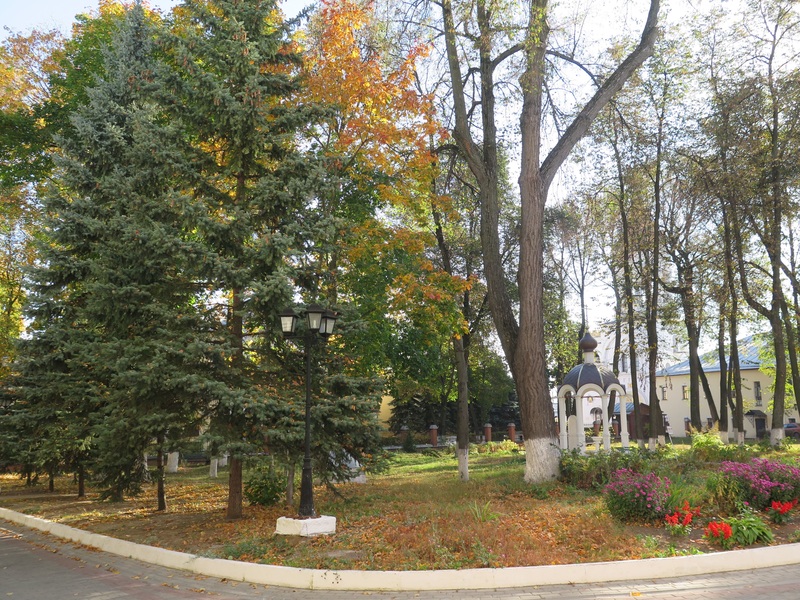 In the courtyard behind the church was a beautiful garden, enclosed by the church, what we were told was a monastery, and a bell tower. We could see someone ringing the bell as we stood in the courtyard. I believe this is the courtyard outside of the Cathedral of the Nativity of the Christ. 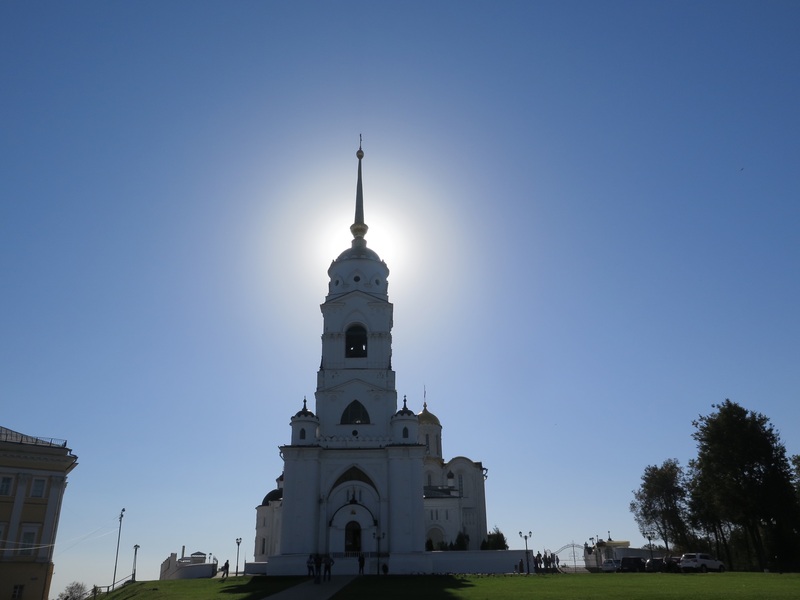 Belltower in Honor of St. Alexander Nevskiy. Another picture I was not supposed to take. This apparently bordered a monastery, and the bells were rung (by a person) while we were in the courtyard. The bell ringing, the birds chirping, the choir singing…it was lovely. I stood in the courtyard for a while to take it all in. Walking more, we reached the area of town where tourist sights are more densely situated. The Cathedral of Saint Demetrius. Built somewhere around 1197, the exterior walls of this cathedral are intricately carved. It’s quite striking, in part because it is a bit different from the other churches we’ve seen. Assumption Cathedral seems to have a halo. We went into this one. There were many, many tourists there, but there was also a service going on (it was Sunday morning). This is the only church where I was actually asked to put on a skirt, although it was implied elsewhere. There was a priest at the door making sure that all who entered were appropriately dressed. 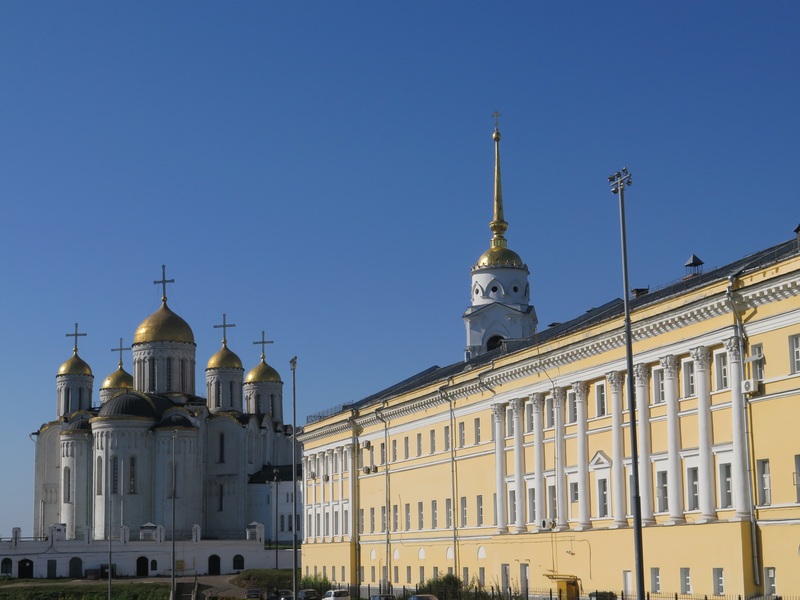 Assumption Cathedral is in the background. I am not sure what the yellow building houses. 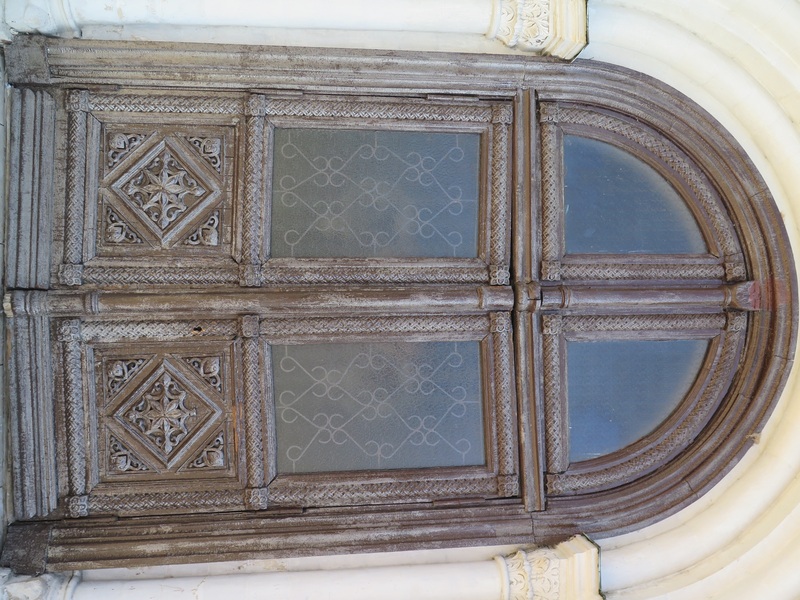 I thought this door on the Assumption Cathedral was beautiful. I don’t recall what this building was. It was not open to tourists, although there was a sign saying what it was (in Russian only). My gratuitous “art” shot of the day. 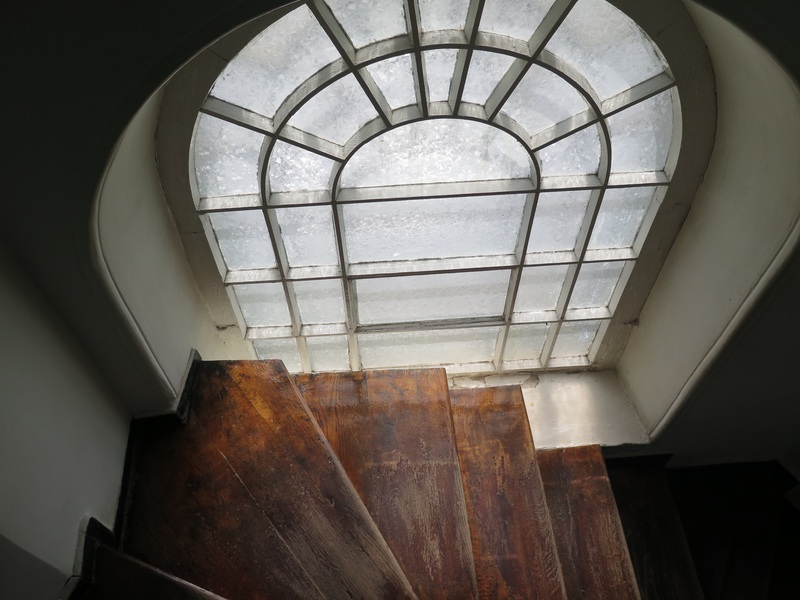 This window was on the staircase in the crystal museum, and I loved how it lit up the gloss on the wooden staircase. 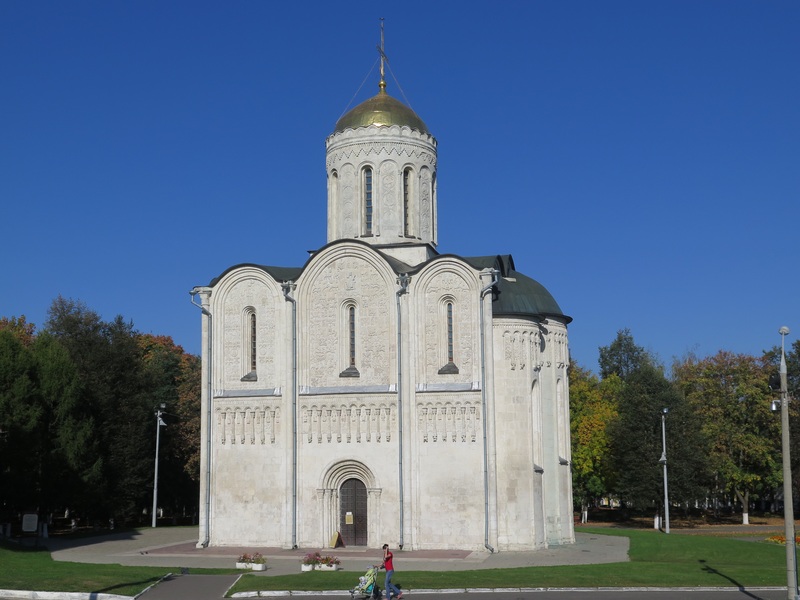 By lunchtime, we were ready to move on from Vladimir to Suzdal, a town about an hour’s bus ride from Vladimir. We’d walked around town for a little under four hours, and felt that was enough.